It has been six moths since the Ruritanian Zeppelin RZ-13 went missing on a flight over Central Morvalistan. The expedition was assumed to be lost until a message arrived by native runner that a great grey bird had crossed the Mountains of the Moon and had fallen into the Urzula Andrez Valley. This valley appears in several native legends as the home of legendary beasts and fabulous wealth. The Ruritanian Government has recruited a rescue mission. The rescuers come from Great Britain, America and France in a humanitarian gesture. Many are drawn by the rumours of great and strange beasts. The original expedition was led by Professor Ivan Gottenlost of the University of Ruritania and another scientist Dr Ohn Kohl as well as his niece, Justa Gottenlost, as the secretary. In addition there was a crew of 1 officer and 2 men The plan is for the Ruritanian Zeppelin RZ-09 to tow three balloons of the famous Pallone design to the edge of the valley and release them to fly in under wind power. The RZ-09 will then circle the valley and pick the balloons up on the other side. The RZ-09 has a full complement of ZepTruppen on board. Indeed the expedition is lost. The actual RZ-13 is the grey wreck and the crew and expedition are roughly 2 to 2½ feet or so away from it in a rough circle. However, the wreck itself has been adopted by the pterodactyls as their new shady nest. The Unter Offizier has a pretty fair idea of where each prisoner is and of the location of some treasures. 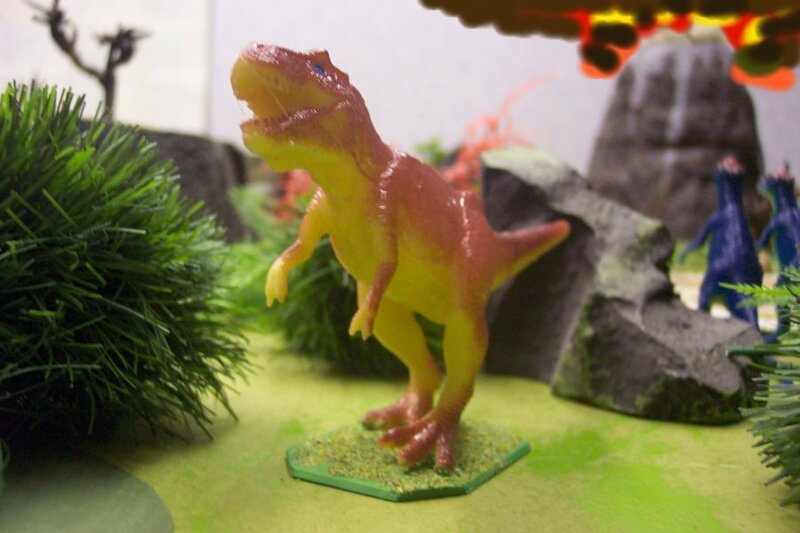 The land is populated by fairly innocuous plant eating dinosaurs. These roam at random being activated by cards. Some will attack if threatened – probably a landed balloon rather than a mere tiny human. The figures come from the collection of Alan Hamilton from a variety of makers and suppliers. The Balloonatics are provided by Mark Copplestone’s Back of Beyond and High Adventure ranges, Foundry’s Darkest Africa range and Bob Murch’s Pulp Figures ranges. Copplestone Castings and Pulp Figures provide the Cavemen and Neanderthals with the lovely cave girls coming from Shadowforge who sell only female figures! The flying Brimstonites are old figures from the RAFM Space 1889 range. The victims scattered around the table are from various Foundry, Reaper Fantasy, Pulp Figures and West Wind ranges. The metal dinosaurs are from the Honourable Lead Boiler Suit Company (HLBS) and the plastic dinosaurs are from the Poundshop, Woolworths, Early Learning Centre, Edinburgh Museum and many other places. The Balloons are converted from a gift in a “My Little Pony” Happy Meal picked up at a car boot sale. They are sometimes on e-bay. Find out how I made them here. Use your browser back arrow to return here.